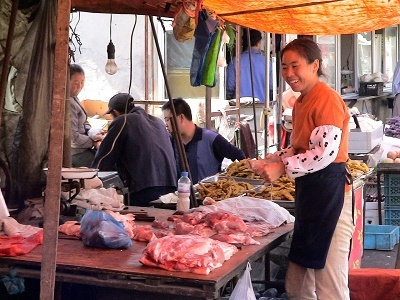 Like any country, the cost of living varies, but what makes living in China different is that the cost of living is still lower than any other place in the developed East. The ability to survive on a tight budget of RMB100 is possible even in Beijing and Shanghai - China's two most expensive cities. Shanghai, Beijing and Hong Kong (see our City Guide to Hong Kong) are progressive cities when it comes to quality living standards, with top-range apartments based on a comparable western lifestyle. However, for an expat starting out overseas, it may be wise to stick to the living standards of the lower and middle class. That doesn't mean that you have to be a penny-pincher. You can still afford a higher standard of living in China; buying a car and a house in Beijing is much cheaper than the equivalent in the US, and in Beijing you can even get away without buying a car. Going local also helps your budgeting. If you're not fussy about food and are not intimidated by the sight of noodle stalls, then you'll be well fed in China. From noodles to dumpling houses, the food is generally inexpensive. Use public transport whenever possible to save costs. Rent a reasonably priced yet cosy apartment. Buy clothes and goods from the numerous Chinese markets, but note that having clothes tailor-made is very affordable as well. Basic food like meat, fruits, vegetables and beer are cheap in a supermarket, but it is wishful thinking to expect good bread, cheese or sausages in the nearest grocery store to have the same price tag. On the other hand, education in China can be costly; sending children to an international school in China means parting with more than US$ 100,000 per year in the main cities. There's one rule that everyone follows in China in any city: haggle, barter, bargain and negotiate. In a hotel, ask for a special rate. When shopping, always ask the price first, as the real price is usually half of the original price. Take a calculator to the restaurants with you and ask how much each dish costs; on rare occasions, prices go up if you don't ask. Renting an apartment, eating out frequently and paying for your travel expenses can cost an average of around US$ 1000 a month.